Can you tell I got swept away by the holidays?!? Feels good to be back to normal. At the beginning of last year I had set a goal to do 12 pair of socks in the year. Well, as many of those new year goals go, I didn’t quite make it. I did however get 5 pair of socks done. I had already blogged about the Escalator Socks and Hermione’s Everyday Socks, but I thought it would be nice to put up pics of all the other socks I had finished. 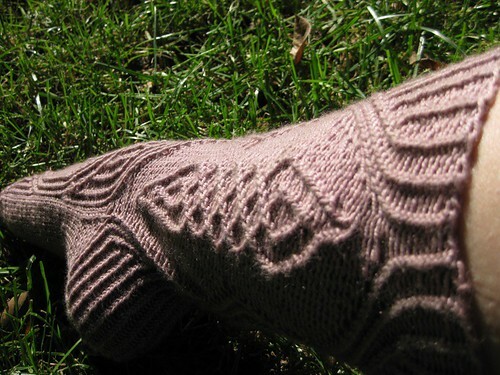 April Socks: Ellington Socks by Cookie A. These were the ones that took the steam out of the 12 socks/1 pair a month project. I loved knitting them, but I got to a spot that was tricky to knit while with friends, and that made it hard to finish them. A lot of my knitting time happens to be at knitting groups. They didn’t get finished until we had a trip to Seattle in September. Love all the cables on them though! Fun to knit and beautiful to wear. 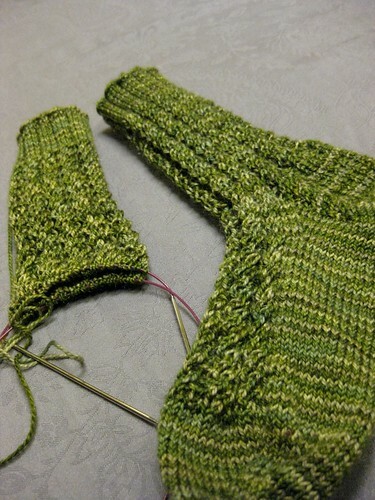 While I am not going to try and do a 12 socks in 2011, I have cast on a pair for the new year. 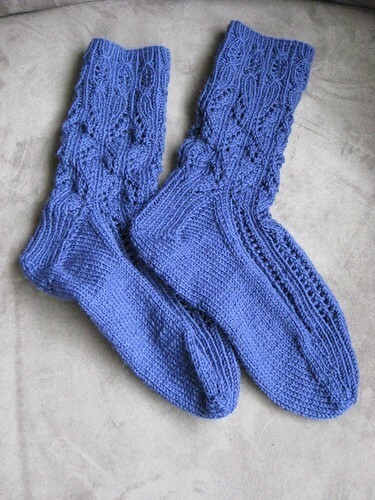 These are the Nine to Five socks by Nicole Hindes. I am making them out of a Fleece Artist yarn called Nyoni that I purchased on our trip/honeymoon in BC, Canada. This pair is for Anthony to enjoy since he’s worn through several of his other pairs. Yarn has been by far my favorite and best souvenir from our trips providing lots of memories for years to come. Ahhh! LOVE the Gillyweed socks. I have a friend who those would be perfect for. Of course…I will need a pair as well. Awesomeness!! Love updates like these. The socks turned out awesome. 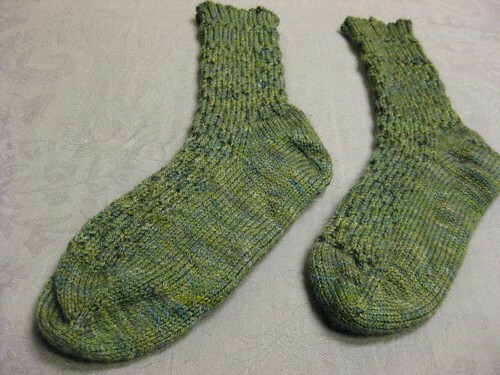 Love the March Mystery Socks and the yarn for the Gillyweeds is quite pretty. What a great reminder as to where that yarn came from! 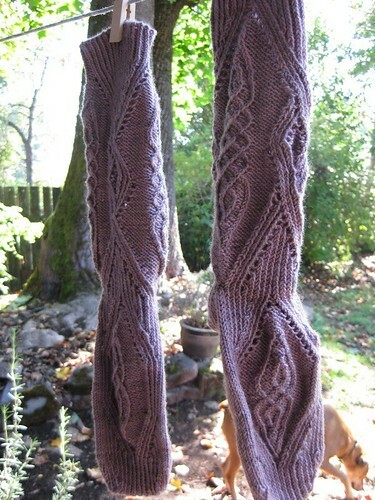 Sock yarn for the Gillyweeds was from Dyelots here in Eugene! If you haven’t checked out Janis’ shop yet, it’s worth a look.